China Miéville is fast becoming one of my favorite authors as The City & The City made my top reads this year so far and Un Lun Dun is now up there as well. I still need to dive deeper into his work to be sure as I've heard the majority of his other books are much darker, but his imagination, prose, and pacing are impeccable. 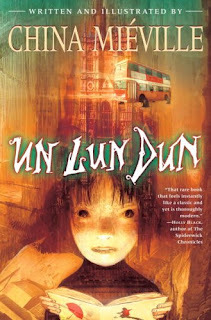 Un Lun Dun is Miéville's try at subverting Young Adult Fantasy, which turns out to be one of the best attempts in recent years. Un Lun Dun is also adorned by a couple dozen drawings by Miéville, which work beautifully but I do wish there were more. 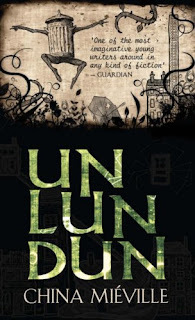 Un Lun Dun starts with unusual things happening to teenaged Zanna in her hometown of London. It seems as if Zanna is destined for greatness however much she doesn't understand or believe it. She and her best friend Deeba stumble into Unlondon, which is where all things that are forgotten end up and whole subcultures have developed. Binjas, a talking book, words made manifest, Window Spiders, a needy milk carton, an umbrella wielding adventurer all make this one exciting and nutty read. Zanna's enemy is an evil sentient cloud of Smog along with his smoglodites, which works surprisingly well. Miéville quickly turns the idea the destined one on its head and pushes it to all thing Un. I doesn't matter how old you are as long as you have some imagination you will get a wonderful book. I'm fifty and it was a great pleasure for me to read this book.